As I have mentioned somewhere in a previous post, the Raspberry Pi community is very friendly and eager to help people. One of the most proactive groups I have come across is a meetup group in Cambridge called CamJam*. One of the organisers of CamJam, Michael Horne, mentioned something on twitter the other day which caught my eye. He was talking about the CamJam EduKit, which he had helped develop with the PiHut in order to provide teachers with everything they need to get started with the Pi. *Raspberry Pi meet ups are held all over the country and referred to as Raspberry Jams, but I have yet to find one near me in London (I’ve only seen information about the Cambridge and Manchester Jams so far, but maybe I’m looking in the wrong place). The Cambridge one seems to be a really friendly event and I would love to live close enough to pop by. There are two things which appeal to me about the CamJam EduKit, firstly they’ve really thought things through and have also created a bunch of basic worksheets, which can be found here and secondly, it only costs £5 plus p&p (which was £2 when I bought my kit). It’s a useful little kit – you get 3 LEDs (light emitting diodes if you want to get fancy), a simple switch (mine came in two parts, but I’m not sure if this is normal – you simply push the red bit onto the base to make a working switch), some resistors (according to the data sheet, 3 are 330 ohm and a is 4.7k ohm, sadly, at this point in time, this doesn’t mean a great deal t0 me), a small bread board, a buzzer and some wires. Since owning a Raspberry Pi, I’ve learnt a lot about jumper cables, but the simple fact is, if it’s a sticky out end, it’s male, if it’s a hole to slot something in, it’s female. You can have male to male, male to female and female to female cables; the female end plugs onto the GPIO pins of a pi, the male ends slot nicely into bread boards, but realistically you’ll need a selection of wires for most experiments so it’s great that this kit gives you several male to female along with a couple of male to males AND they’re conveniently colour coded. I would, however, recommend taking a look on ebay or amazon as I picked up a pack of 20 or so of each type for a couple of pounds – I’d also like to mention that when I first got a Raspberry Pi, I naively went to Maplin and asked the young man at the desk if he could help me find some female to female jumper cables…he looked at me blankly and wondered around pointing out a variety of different cables before giving up, so when you’re talking about jumper cables, don’t expect other people to know what you mean!! So, the first of the CamJam sheets is a very simple ‘setup and go’ activity – the traditional first thing to do with code is get the computer to print back “Hello World!” and so, of course, this is the first thing that the CamJam sheet has us do. I like the layout of these sheets – it’s very clear what you are expected to do, but how easy is it to actually apply the instructions? The first thing to point out is that page one is all about the set up for a B model pi, so if you have a B+ your setup will be different – I have been told the revised version for B+ is coming soon. 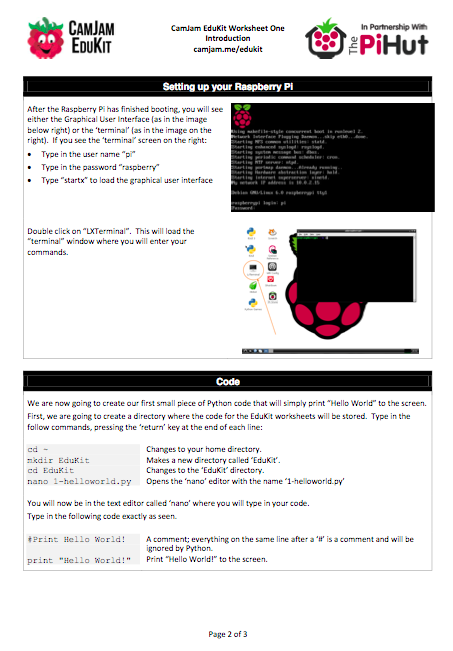 The second page takes you through logging into the pi and loading up LXTerminal, which is great information for beginners and then the actual code itself is explained very well. So, I followed the instructions through from start to finish and everything has worked as planned, my only problem – I’m now stuck in terminal inside the EduKit directory and I have no idea how to get out of it, however, a quick bit of experimentation has allowed me to discover that I can get back to the home directory by typing in cd ~ again – hooray! Time to take a look at sheet two and see how we get along – we’re moving straight onto the tricky stuff here with both LEDs, resistors and a bread board (which I still know nothing about). 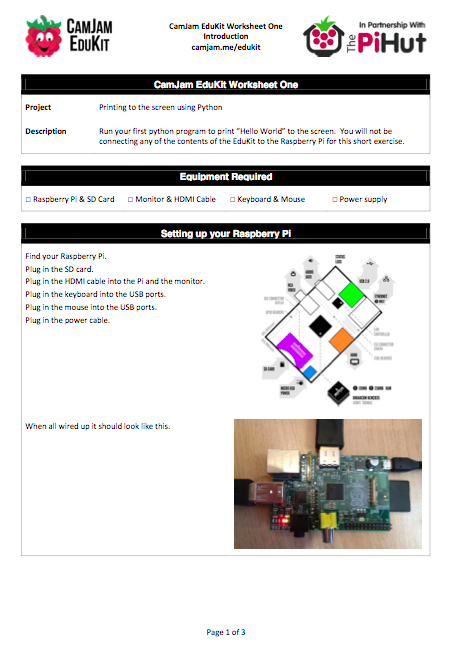 The first few pages of this sheet are a helpful guide to the components – I’m beginning to think that this kit is aimed at KS3 children, but it’s helping me and I think the more able KS2 children would really enjoy learning some practical applications of the python they’ve been learning in Codecademy. 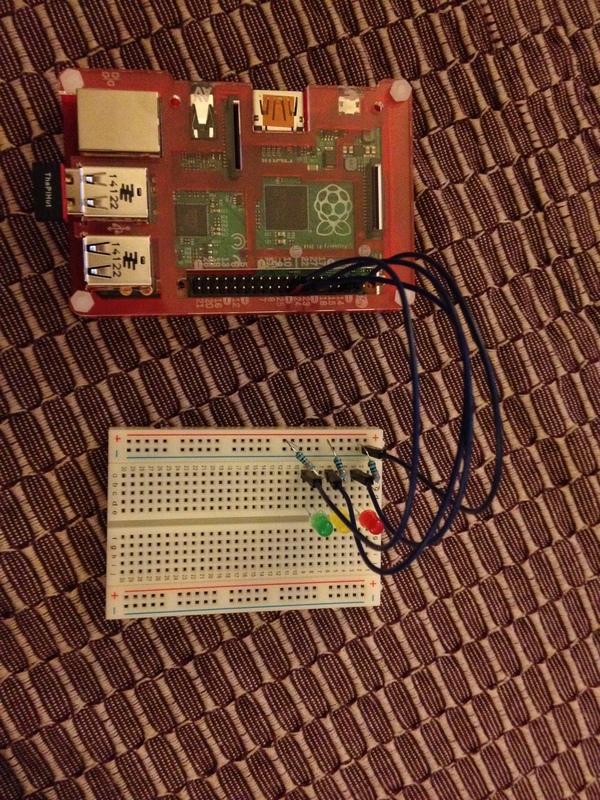 So, the first thing I needed to do was turn off the pi and build my circuit – the worksheet doesn’t guide you through shutting down, but luckily I knew to type ‘sudo halt’ into my LXTerminal window. I’m not going to lie, this was the first time I’ve used a bread board properly and I felt a massive sense of achievement once I’d slotted in all the bits. I originally had problems getting things to stay in place until my other half pointed out that I needed to really push the resistors into place and not just slot them in loosely. Achievement unlocked, it was now time to start typing some code and I fell into my first foolish mistake while trying to access my EduKit directory. It’s so important to remember in Python that case matters so my first attempt to access the directory lead to a “No such file error” because I’d forgotten the capital K for EduKit. An easy, but common mistake. What I particularly like about this worksheet is that after you’ve typed in the lines of code, they are explained below so that you have an idea of what you are doing. My only problem was that I had made two mistakes in my code – firstly I’d written a full stop instead of a comma in one line of code and secondly I’d written ‘LOW’ as lowercase by mistake and I had to figure out how to access my code to edit it and the sheet doesn’t explain what to do – luckily I figured out that you just need to retype the nano command again to access it. Anyway, so far the first two sheets have been really easy to follow so let’s finish off this post by taking a look at sheet three since it immediately follows this one. The third sheet in this series simply walks you through typing the code to make the LEDs blink – this time there are a lot of hashtags in the code, which means notes from the writer rather than relevant lines of code so I obviously didn’t type them into my terminal, but these stood as simple, useful reminders of what different commands meant. The explanation for this code is therefore embedded in the code rather than as a box at the end – I like this because it feels like progression from the first two sheets where everything is explained separately. It was during the debugging stage (I’d randomly put a full stop in the middle of the first line of code), that I remembered that by pressing the up arrow you can get the terminal to repeat a previous sentence so instead of constantly typing in “sudo python 3-blink.py” I could just press the up arrow a couple of times and it appeared for me – useful thing to know! Anyway, while I feel the electronics setup may be tough for some of the less able KS2 children, these are a fantastic set of sheets for use with upper KS2 and certainly with KS3 and I’ve been really impressed with the ease of use and the attention to detail. For the beginner, this is a really useful tool and I would definitely recommend taking a look and purchasing a kit yourself. 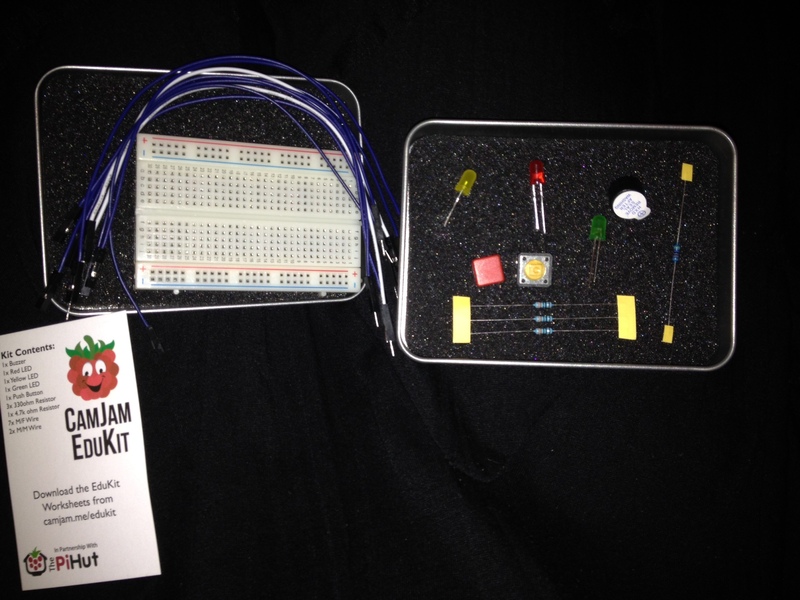 If you are planning on handing these worksheets and kits to children to work from, I would emphasize the importance of knowing which GPIO pins are ground, and live and probably encourage them to check with an adult before booting up in order to avoid damaging/destroying the Pi (which can be done with an incorrect setup!). The lovely PiBow Coupe case that I bought from Pimoroni helpfully has all of the pins labelled to avoid confusion and for the B model Pis you can print out something called a Raspberry Leaf which is a simple guide to the pins (I’m sure there will be one for the B+ available soon). Someone on my course actually had a little keyring Raspberry Leaf made from an old circuit board which slotted over the pins, which I thought was pretty cool. Anyway, it’s definitely worth checking that you have your circuit set up correctly as GPIO to ground and not live to GPIO or something equally destructive! So the conclusion is that these are a great free set of sheets, especially for beginners and the really cheap kit has everything I’ve needed so far to complete the tasks and feel a smug sense of self achievement. 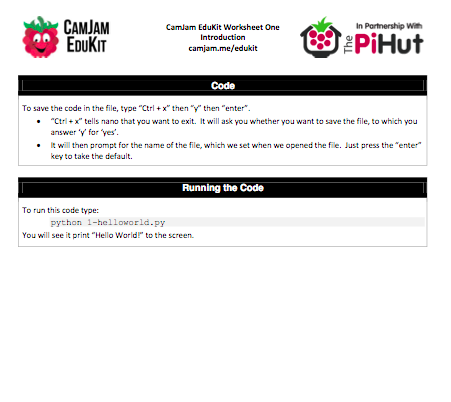 Thanks CamJam and PiHut – keep up the good work! This is an excellent and honest review of our EduKit, with some useful additions I can make to the worksheets that will help. Thanks, Cat.